Whether postoperative chemotherapy should be added to endocrine therapy or not is an important issue in patients with hormone receptor-positive and human epidermal growth factor receptor (HER)2-negative breast cancer. To identify patients who should be treated with additional chemotherapy, prognostic factors were investigated in breast cancer patients postoperatively treated with endocrine therapy alone. Tumor samples and clinicopathological data were collected from patients who underwent curative surgery and were postoperatively treated with endocrine therapy alone between 1999 and 2003 in three different institutes. 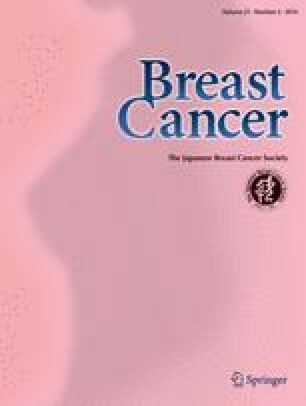 Expression levels of estrogen receptor (ER), progesterone receptor (PgR), and HER2 in primary tumors were centrally retested. Patients with ER-negative and/or HER2-positive tumors and/or with unknown nodal status were excluded from the study subjects. Immunohistochemical analysis of Ki67, HER1, insulin-like growth factor-1 receptor, and aldehyde dehydrogenase-1 was also performed. Prognostic factors were investigated by univariate and multivariate analyses. A total of 261 patients were the subjects of this study. The median age was 59 years old, the mean tumor size was 1.9 cm, the node-positive rate was 20 %, and 65 % received tamoxifen alone. Distant metastases were observed in 11 patients at a median follow-up of 98 months, and four patients had died of breast cancer at a median follow-up of 99 months. Univariate analysis showed that marked lymphovascular invasion (LVI), PgR negativity, high Ki67 labeling index (LI), and high nuclear grade were significantly worse prognostic factors for distant metastasis. Multivariate analysis revealed that marked LVI [hazard ratio (HR) 21.8] and PgR negativity (HR 10.3) were independently worse prognostic factors for distant metastasis, respectively. Multivariate analysis also revealed that marked LVI (HR 287.3), PgR negativity (HR 25.1), and high Ki67 LI (HR 19.6) were independently worse prognostic factors for breast cancer-specific death, respectively. The results of this multi-institute cohort study indicated that endocrine therapy alone could not prevent distant metastasis in breast cancer patients with PgR-negative tumors and/or with tumors showing marked LVI or high cell proliferation. These patients may need postoperative adjuvant chemotherapy in addition to endocrine therapy. This study was supported by grants from Kawasaki Medical School (no. 22-A9, 23-18), the Ministry of Education, Culture, Sports, Science, and Technology (no. 20591561), and the National Cancer Center Research and Development Fund (no. 21-4-4). We thank the members of the Working Group sponsored by a grant from the National Cancer Center Research and Development Fund (no. 21-4-4) for their helpful discussion. We also thank Ms. Megumi Ogoh for her technical assistance.